As impressive as unraced colt Spaceboy was in his six length trial romp, trainer Gary Portelli is adamant he’s not a one trick pony ahead of his debut at Rosehill on Saturday. If he leads the $150,000 Golden Gift (1100m) then so be it, as Portelli says a lot of early season two-year-old races are won by those in the first three, but he’s sure there’s a lot more to the son of Deep Field than his 800m trial showed. Portelli already has one youngster with one foot in the Golden Slipper and he’s hoping Spaceboy can prove worthy of joining Time To Reign on that path in the new year. 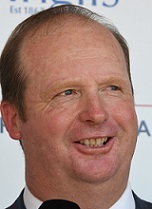 “I teach my young horses when the gates open in barrier trials they have to jump and run,’’ Portelli said. “I don’t like easing them when they are being educated. When you get into a race where there is speed you can decide whether you want to lead or whether you can back out of it. “The fact that nothing could keep up with him might be misleading, maybe the horses following were having easy trials. “On Tuesday morning he worked in behind Vincero on the course proper over 800m, he followed around the corner, gave a squeeze at the top of the straight and accelerated beautifully. In early Golden Slipper betting Spaceboy is at $26 with his Golden Gift rivals Cardiff $17 and Tassort $26. Time To Reign is one of three $15 equal favourites alongside Anaheed and Gimcrack Stakes winner Catch Me. Spaceboy is in a three-way battle for TAB favouritism on Saturday at $3.10 also with Cardiff ($3) and Tassort ($3.50). All three are trial winners, Spaceboy’s win was at Warwick Farm on November 9 while Tassort won a heat at Rosehill on November 2 before running second to Cardiff at Canterbury 11 days later. “This will tell us whether we have a top class Slipper type horse,’’ he said. “If you come away winning this you’ve got a serious racehorse. It’s a different pressure they’ll be under compared to a trial. His other potential Slipper contender Disruptor had to miss a planned start a couple of weeks ago after pulling up sore from a workout and will resurface in a couple of months. If there’s to be an upset on Saturday, Portelli is wary of the Snowden-trained Jonah who finished second to Time To Reign at Rosehill three weeks ago. And Portelli is well aware there can be upsets as he won the Golden Gift last year when Secret Lady, having her second start, downed debuting odds-on favourite Plague Stone. “It’s hard to get real a guide because I don’t know how good (Time To Reign) is yet,’’ he said. Meanwhile, Portelli is anticipating Strome will be very competitive in the Rosehill Bowling Club Handicap (1500m) if she’s afforded a bit of luck. The four-year-old, $11 with TAB, clocked the fastest last 600m of the race with a 33.16 (Punters Intel) when she ran ninth first-up behind Falerina in an unsuitable 1100m event and Portelli said she’s not far off a win. “She ran out of her skin at that level,’’ he said.